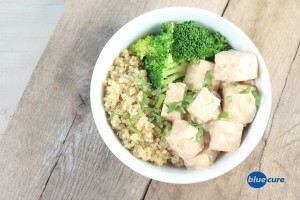 This ginger peanut sauce is delicious! Unlike most recipes you’ll find on the Internet, it contains no added sugars—just a few pitted dates!! Add a little hot peppers or hot sauce to spice yours up— or enjoy as is! Combine 2 cups water and 1 cup quinoa in a sauce pan and bring to a boil. Reduce the heat once boiling, and then cover the pit to allow the rice to simmer for about 15 minutes. In a bowl, mix peanut butter, soy sauce, and date paste. Add water to thin, as needed. *If using pitted dates, blend pitted dates, peanut butter, dates, and ~1/4 cup water. Add more water as needed. In a pan, sauté the mince garlic and ginger. Add this to the peanut sauce. If using tofu, sauté the tofu first until it starts to brown a bit, then add the peanut sauce. Pour peanut sauce over diced tofu or chickpeas and sauté on low heat for 2-5 minutes. Wash and chop the broccoli. Sauté in pan until final texture. Finally, layer all the ingredients on a bowl or plate. Top with fresh cilantro, if desired. Note: You don’t need to use oil to sauté. Try using a small amount of water. Start with about 2 tbsp- 1/4 cup and add more as needed during the cooking process. Avoid using too much water right away, as this will make the food mushy.